Holmes Boxing's Cold War take place Jan. 24th at the Buffalo Thunder Resort and Casino. Holmes Boxing Open Workout at The Fight Shop is open to the public. 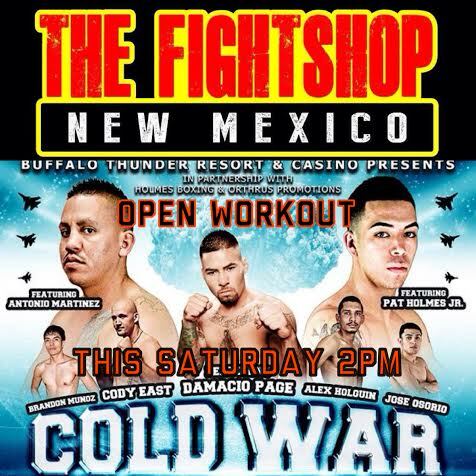 This afternoon, Holmes Boxing and Orthrus Promotions will hold an open workout at The Fight Shop New Mexico to help promote their January 24th “Cold War” professional boxing card slated for Buffalo Thunder Casino & Hotel in Santa Fe, New Mexico. The open workout will feature up-and-coming boxers Patrick Holmes Jr. and Antonio Martinez. Fans will also be able to see Legacy MMA Champions and UFC hopefuls Damacio Page who will be preparing for his professional boxing debut and Cody East who is looking to extend his undefeated boxing streak to three wins. The bouts next Saturday take place at 7pm inside the Buffalo Thunder Casino and Resort in Santa Fe. Tickets range from $30.00 to $75.00 and can be purchased via the event hotlines 505-795-2772 / 505-699-2845 or from any boxer on the card. Note: A fight card has yet to be made available to the media. Location: The Fight Shop New Mexico located at 6200 Coors Blvd NE Suite A4.